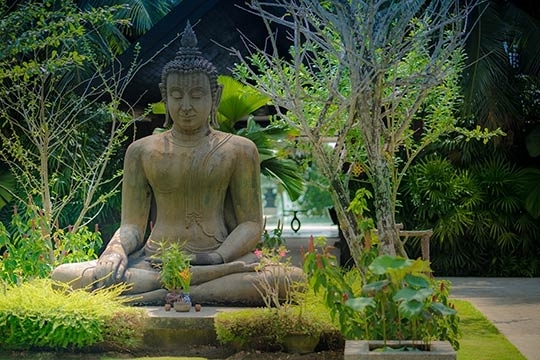 You could be forgiven for thinking that Thailand, with its ever-growing numbers of visitors, would be full to the brim by now, with every little corner explored and occupied. But you’d be wrong. There are still secret corners known only to a privileged few. One of these is Natai Beach in Phang Nga, just north of Phuket. The beach is seven kilometres of soft sand where there’s rarely a soul to be seen. The phrase “beach getaway” could have been invented for this stretch of sand. 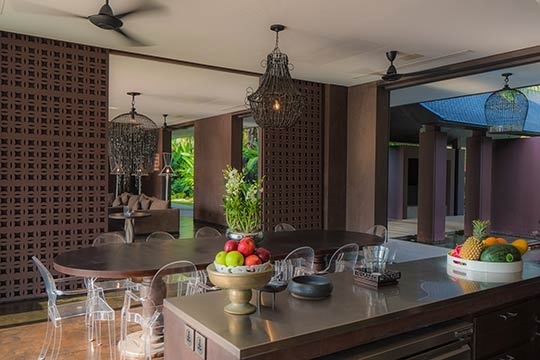 And it’s here that you’ll find Villa Saanti, the ultimate Phang Nga beachfront villa. 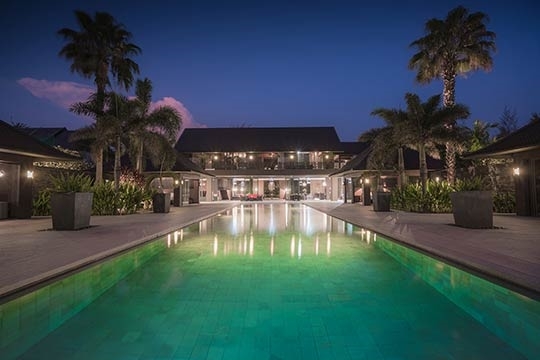 Even the name is appropriate – it means ‘Villa of Peace’. 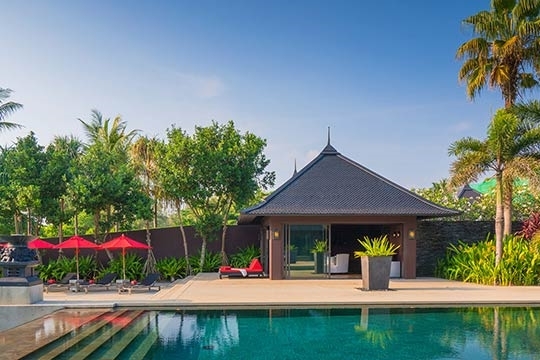 With larger grounds than most high-end holiday villas (more than 4,200 sqm), this six-bedroom villa can sleep up to 18 people with ease. 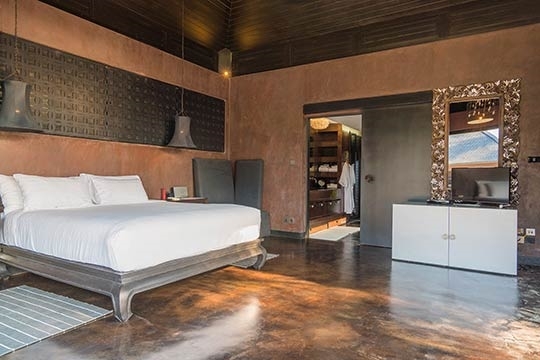 The impressive master suite, the villa’s gym and a guest bedroom are situated on the upper floor of the main pavilion, above the large and comfortable living and dining area. 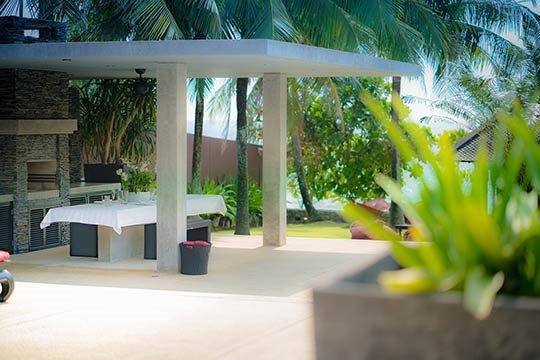 Between here and the beach are four luxurious guest pavilions, each a self-contained unit. 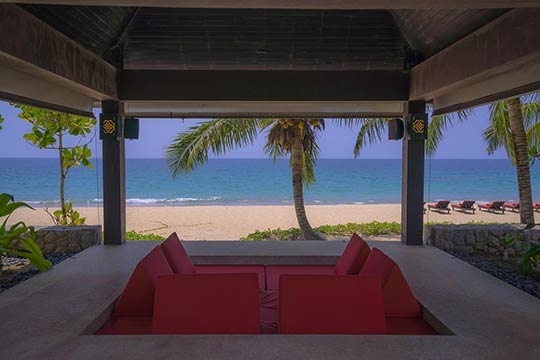 For relaxation, you can choose to lounge in the cool shade of the living room; disappear (with or without loved ones) under the canopy of the huge daybed looking over the beach; enjoy desultory chat in the sunken sala, or refresh your tan on the poolside or beachside sun loungers. Nor is the villa short of swimming options. 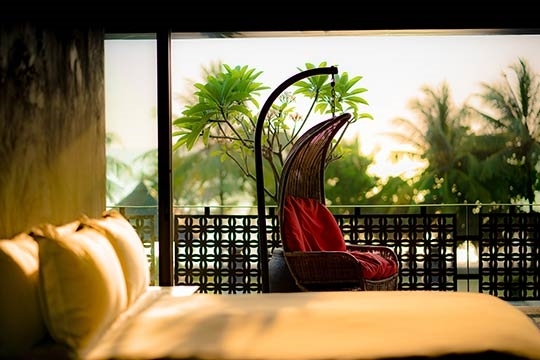 Apart from lazing in the warm waters of the Andaman Sea, the villa has not one, but two pools. 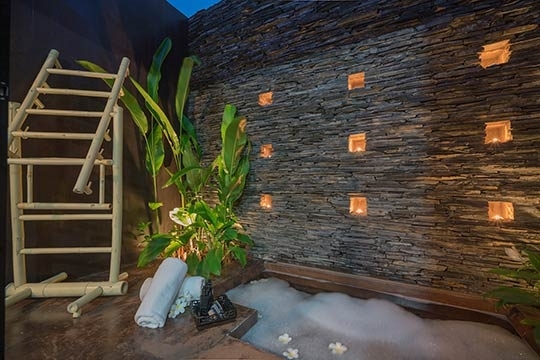 The larger pool overflows into the smaller one at the edge of the garden, and features jacuzzi bays – with bubbles to match the ones in your Champagne. 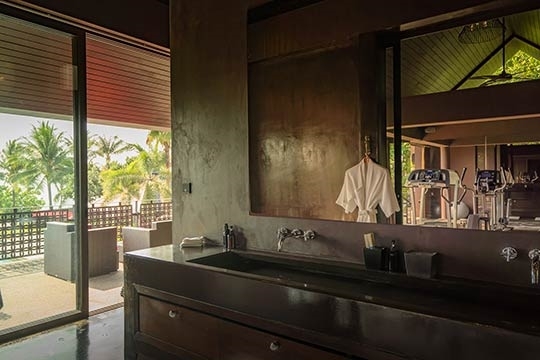 For a more private, romantic soak, each of the guest pavilions has an open-air bathtub, the wall punctuated with niches for atmospheric candles. And for after-dark entertainment, there’s the media room with its huge TV attached to satellite, DVD or Wii system. 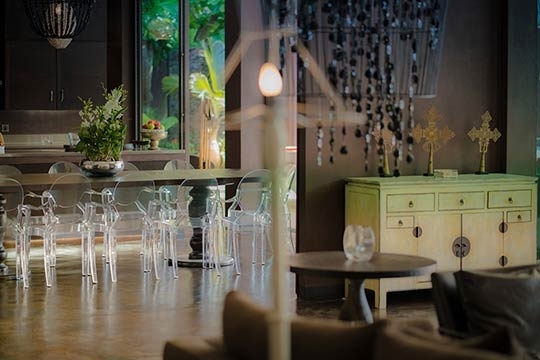 The sole job of the staff of five – which includes a skilled Thai chef on hand to prepare a delicious selection of Asian and Western dishes for your enjoyment – is to keep guests happy, and they excel at it. 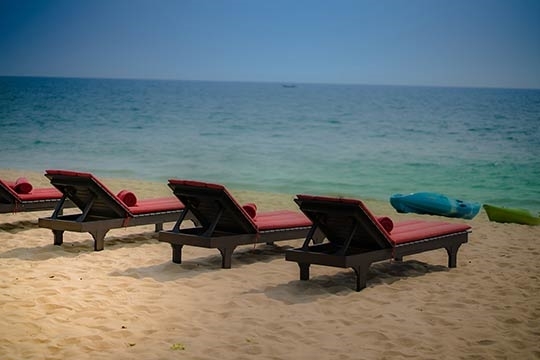 Beachfront bliss far from the world’s troubles. 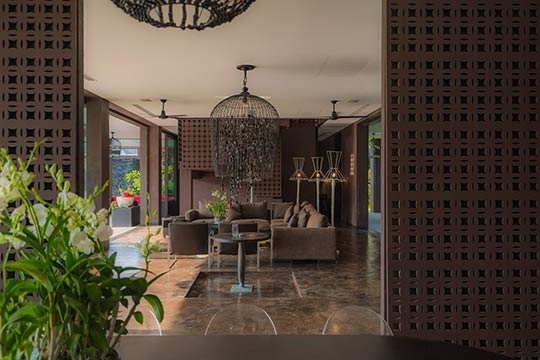 It’s a matter of taste, of course, but we found the ubiquitous chocolate brown colour used in Villa Saanti a little overwhelming. 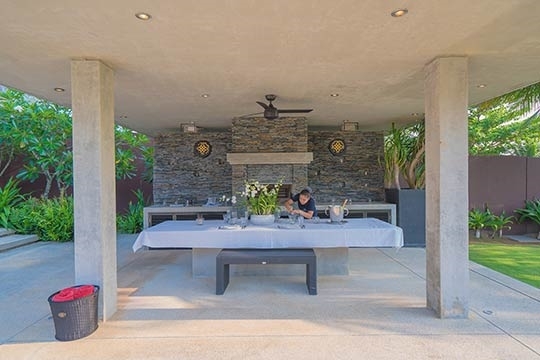 That said, this was a very minor quibble when set against the clever design and attention to detail that makes this Phang Nga beachside villa a delight to stay in. One thing worth mentioning at the start: Villa Saanti is very spacious. 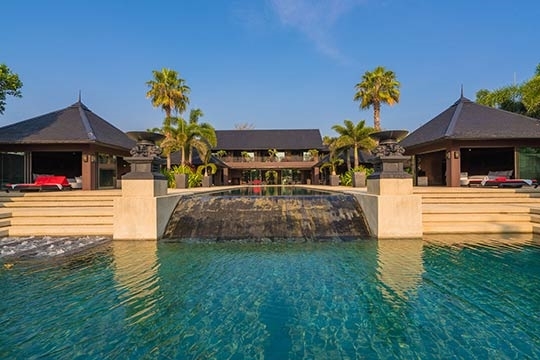 The land on which it stands is a third larger than most other Thailand villas in this range, so it never feels crowded. We didn’t fill it up – that would require 18 people ( extra charge to be applied in excess of 12 people) – but it was easy to tell that escaping for private moments would be easy. 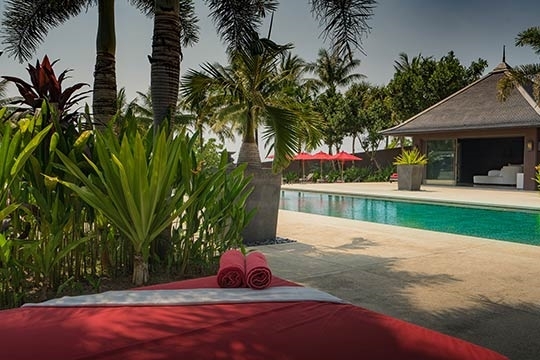 Most appropriately for a getaway under the tropical sun, the focus of the villa is the twin pools, the larger overflowing into the smaller, which was clearly designed with children in mind. We spent a lot of time tanning and dipping, tanning and dipping. The hyper-attentive staff – though they might not have understood every word exactly – always seemed to sense what we needed, when we needed it (sometimes before), and the villa manager, Mr Wow (an apt name if ever there was one for a luxury villa manager), who speaks flawless English, was always on hand to fill in linguistic gaps, or to book a tour, a taxi or a masseuse. 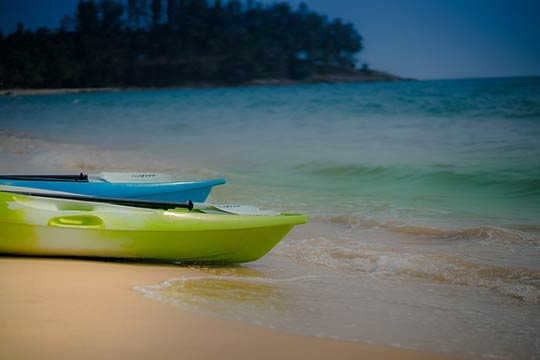 Although it’s tempting to stay at the villa and do as little as possible, the locale offers plenty for families or more energetic groups to do, from a water park to white-water rafting. 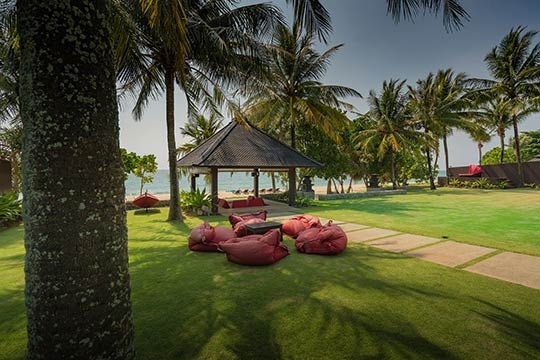 Natai Beach itself may be very quiet, but it boasts one of Thailand’s top beach clubs, Baba, which happens to be just 10 minutes’ stroll along the sand from Villa Saanti. 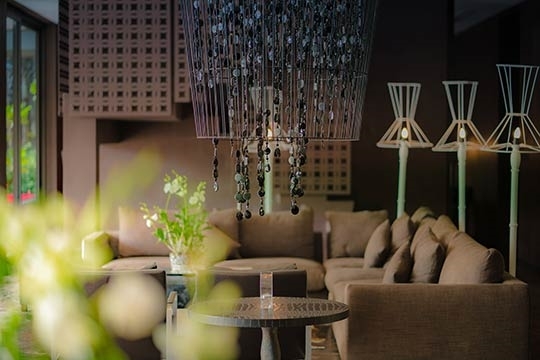 Sleek and sophisticated, Baba is a must-visit for an evening out. The wood-fired pizza oven was a huge favourite with us. Who doesn’t like homemade pizza? And being right next to the child-friendly smaller pool it’s perfectly located. 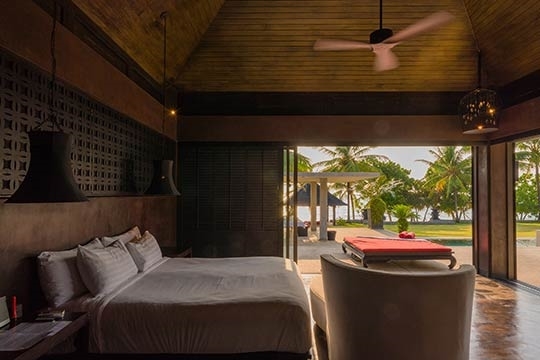 Villa Saanti is also beautifully designed for lounging around: sunken sala and gigantic daybed, both next to the beach, and 10 beach loungers, so that those who get up late don’t have to worry about missing the best seats. 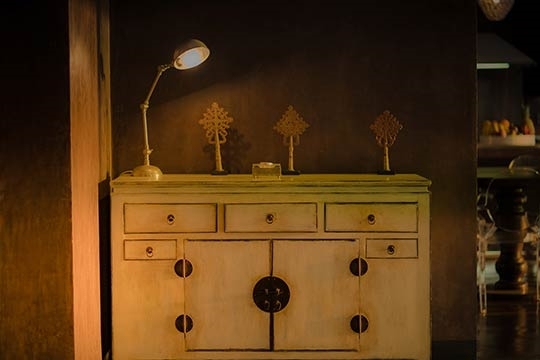 The lighting in the bedrooms seems to be set by default at very low levels. This may seem romantic, but try finding that earring you just dropped while getting dressed for dinner. The huge sliding glass doors in the pavilions and main house do make the most of the view but they are too heavy for a child or an elderly person to move easily. The two pavilions set in front of the main house have no sea view, which seems a pity. Thanks for everything the staff done for us, we had a great stay. We stayed four days at this awesome villa. All the staff were great and friendly, especially Noom. Super helpful and always try to get done whatever we want. Our last day here, we will definitely miss this place. Thank you for the wonderful stay at Villa Saanti. Everything was perfect - the staff, the food and all the pasties we could enjoy at this place. Hope to see you all again. We stayed 4 days at this awesome villa. All the staff here are great and friendly, especially Noom! Super helpful and always tries to get done whatever we want. Our last day here and definitely miss this place. It's our 3rd and last day here and sad to see time fly by so quick. We loved the villa and the exceptional staff. Look forward to coming back next year. Thank you for great service and beautiful villa. Great Staff. We had a wonderful time in Phuket. The hospitality was amazing and our family had a great time. Thank you for opening your lovely house to us. We had a perfectly peaceful Chinese New Year holiday here. The whole family was well taken care of by all staff and truly enjoyed it. Special appreciation to the chef for cooking us some great authentic Thai meals, and to our passionate butler for his excellent service. Hopefully we will be able to return. Thank you very much! 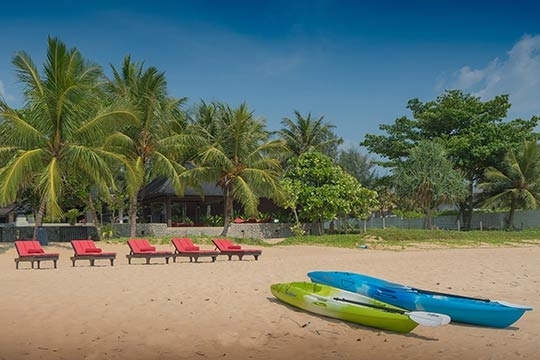 Villa Saanti is towards the southern end of glorious Natai Beach, an almost deserted seven-kilometre stretch of golden sand. 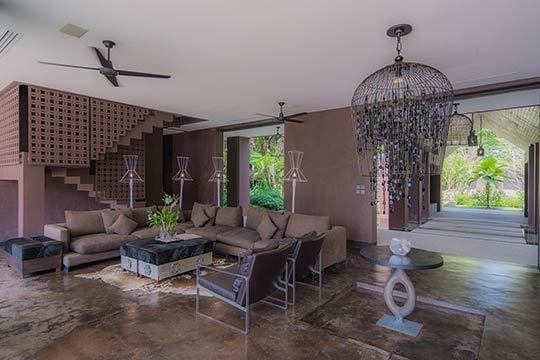 There are other high-end holiday villas in the area, and, further up the beach, Baba Beach Club and The Aleenta Resort and Spa, but it’s generally wonderfully quiet. 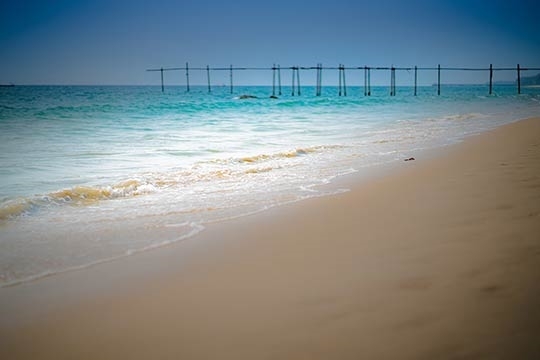 Even the nearby pier, where fishermen used to come in with their catch, has submitted to the demand for quiet by gently falling apart until all that remains are a few picturesque poles from the sea. It looks to have been purposely constructed for those iconic sunset-over-the-sea shots. 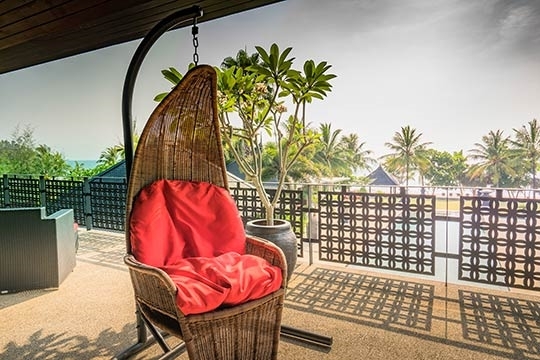 The nearest town, Kokkloi, is about 6.3 km away, but the villa is only half an hour’s drive north of Phuket Airport, and the many natural attractions of Phang Nga province are easily accessible from here. 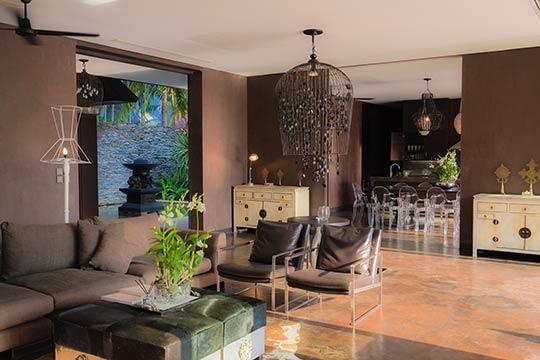 Having passed the large seated Buddha statue at the entrance to Villa Saanti, first impressions at Villa Saanti are of the cool shade of the living areas, and the brilliant sunlit vista beyond. 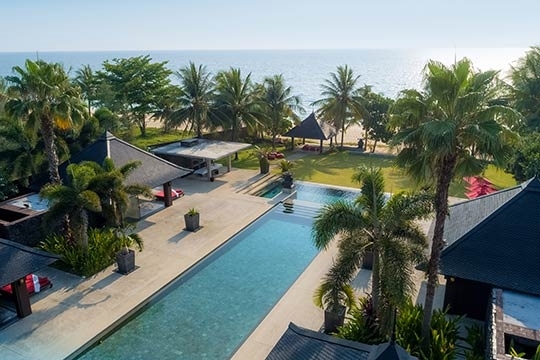 As the eyes adjust, they make out the main swimming pool sparkling in the sun, the palm trees soaring over the gardens and, beyond them, the Andaman Sea. 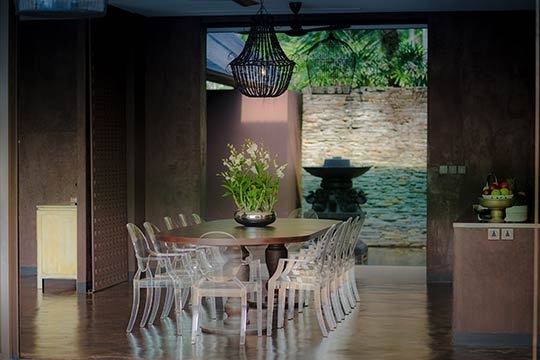 Villa Saanti is designed to make the most of that sea view. In the main pavilion, the dining area and kitchen are to the left of the entrance. To the right is the very comfortable lounge and, beyond that, the TV and entertainment room. 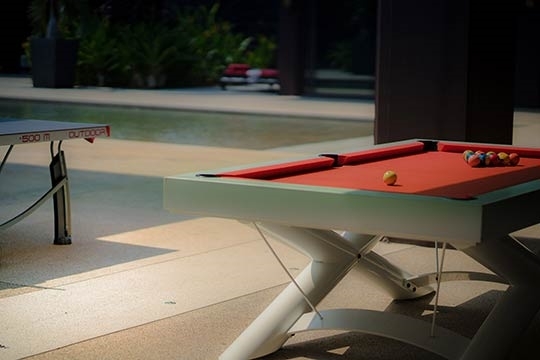 Running the full length of all these rooms is the hugely spacious veranda, tables, chairs and sofas clustered at intervals, along with ping-pong and pool tables. 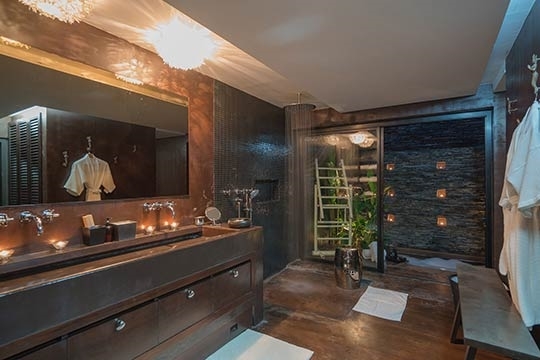 Above is the master suite and one guest bedroom, each with king-size beds, air conditioning and ceiling fans and (in the master suite only) a huge dressing room. 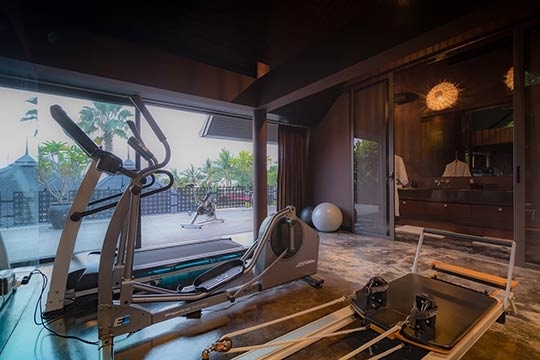 Also on this floor is the villa’s well-equipped gym. Floor-to-ceiling glass doors make the most of the view, in this case with the added advantage of the elevation. 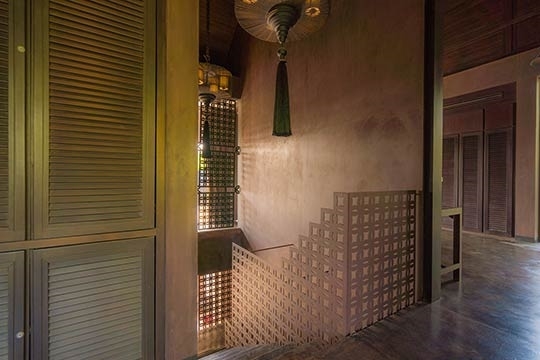 Slide the doors open and step onto the long balcony for an even better view. 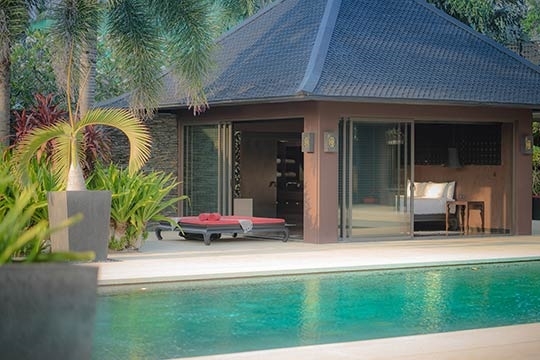 Back on the ground floor, beyond the veranda, is the 20 x 5m main pool, with two sleeping pavilions on each side. All have air conditioning and ceiling fans, king-size beds, chaises longues and large bathrooms, including romantic outdoor bathtubs. And all are equipped with satellite channel TVs. Down a few steps from the main pool is the second pool, shallow enough for children to play in safely. To the left of it is the barbecue area with its wood-fired pizza oven. 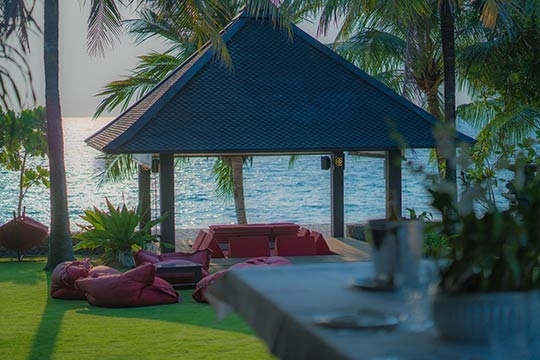 Between that and the beach is the sala, with soft sunken seating, while in the opposite corner of the garden, sitting above the boathouse, is a huge day bed big enough for a family of four. And now you’ve reached the beach. Immaculately raked every morning before the sunbeds are put out under the shade of the palm trees. 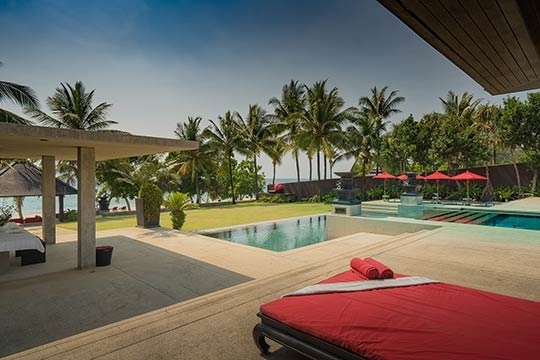 6 bedroom villa located in Natai Beach, Phuket. Ideal for Beachfront, Kid friendly, Going for golf, Room with a view. 7 out of 10 based on 9 user reviews.